This is a scalable context timeline. It contains events related to the event December 1, 1996-June 1997: Russian Arrest of Al-Zawahiri Brings Islamic Jihad and Al-Qaeda Closer Together. You can narrow or broaden the context of this timeline by adjusting the zoom level. The lower the scale, the more relevant the items on average will be, while the higher the scale, the less relevant the items, on average, will be. Mohammed Atef, a.k.a. Abu Hafs. Mamdouh Mahmud Salim, a.k.a. Abu Hajer. Al-Fadl will reveal details about the meetings to US investigators in 1996 (see June 1996-April 1997). Notes to the meeting will be found in Bosnia in early 2002. [New Yorker, 9/9/2002] It will take US intelligence years even to realize a group named al-Qaeda exists; the first known incidence of US intelligence being told the name will come in 1993 (see May 1993). Ayman al-Zawahiri in disguise. [Source: Interpol]Al-Qaeda second-in-command Ayman al-Zawahiri is said to visit Bosnia many times from around this date. A prominent Muslim Bosnian politician later claims that al-Zawahiri visited mujaheddin camps in central Bosnia as early as September 1992. The Egyptian government, which considers al-Zawahiri an important enemy, claims al-Zawahiri is running several mujaheddin operations in Bosnia through charity fronts. They also claim he meets regularly with Bosnian Muslim politicians in Sarajevo. He is further said to occasionally meet with Iranian government representatives to discuss the war in Bosnia, as Iran is supplying weapons to the Bosnian Muslims. [Schindler, 2007, pp. 123, 141] Anwar Shaaban, a radical imam leading the Bosnian mujaheddin effort from Milan, Italy (see Late 1993-1994), remains in regular contact with al-Zawahiri, according to Italian intelligence. [Schindler, 2007, pp. 164] In 1993, bin Laden reportedly puts al-Zawahiri in charge of the organization’s operations in the Balkans. [Ottawa Citizen, 12/15/2001] By 1994, al-Zawahiri will settle in Bulgaria to manage operations in Bosnia and the rest of the Balkan region (see September 1994-1996). Movladi Udugov. [Source: Public domain]According to Nikolai Patrushev, head of Russian intelligence, “In 1996, one of the ideologists of Wahhabism, Movladi Udugov stated that an air attack on the Kremlin was possible and even then we treated that statement seriously.” Udugov is considered the chief public spokesperson for the Chechen rebels. He threatens that the rebels would hijack a civilian airplane and then have a suicide pilot fly it into the Kremlin to protest Russian actions in Chechnya. 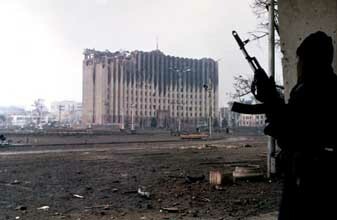 Fighting between Russia and the rebels is particularly intense in 1996, which is the end of the first Chechen war from 1994 to 1996 (see December 11, 1994 and August 1996). [United Press International, 9/15/2001] The Chechen rebels and al-Qaeda are loosely linked at the time, especially through Chechen leader Ibn Khattab (see 1986-March 19, 2002). Osama bin Laden (right), Mohammed Atef (center), and an unidentified militant at the press conference publicizing the expanded fatwa in May 1998. Ayman al-Zawahiri is out of the picture, sitting on the other side of bin Laden. [Source: BBC]Osama bin Laden issues a fatwa (religious edict), declaring it the religious duty of all Muslims “to kill the Americans and their allies—civilians and military… in any country in which it is possible.” [Al-Quds al-Arabi (London), 2/23/1998; PBS Frontline, 2001; Sunday Herald (Glasgow), 9/16/2001] This is an expansion of an earlier fatwa issued in August 1996, which called for attacks in the Arabian Peninsula only (see August 1996). 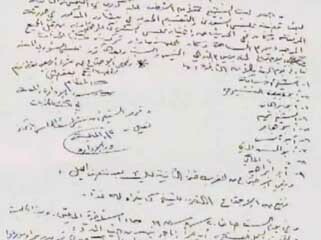 Ayman al-Zawahiri, the head of the Egyptian militant group Islamic Jihad, is one of many militant leaders who sign the fatwa. This reveals to the public an alliance between al-Qaeda and Islamic Jihad that has long been in effect. According to journalist Lawrence Wright, the fatwa was actually mostly written by al-Zawahiri the month before, even though it is released in bin Laden’s name only. (Some members of Islamic Jihad are upset by it and quit the group.) [Wright, 2006, pp. 259-261] Also signing the fatwa are representatives from militant groups in Afghanistan, Sudan, Saudi Arabia, Somalia, Yemen, Eritrea, Djibouti, Kenya, Pakistan, Bosnia, Croatia, Algeria, Tunisia, Lebanon, the Philippines, Tajikistan, Chechnya, Bangladesh, Kashmir, Azerbaijan, and Palestine. All these representatives call themselves allied to the “International Islamic Front for Jihad Against Jews and Crusaders” (the name al-Qaeda has not been widely popularized yet). New York magazine will note, “The [fatwa gives] the West its first glimpse of the worldwide conspiracy that [is] beginning to form.” [New Yorker, 9/9/2002] The fatwa is published by Khalid al-Fawwaz, who runs bin Laden’s European headquarters in London, and its publication is preceded by what authors Sean O’Neill and Daniel McGrory term a “barrage of calls” from bin Laden’s monitored satellite phone to al-Fawwaz. However, this does not motivate British authorities to take any action against al-Fawwaz. [O'Neill and McGrory, 2006, pp. 111] In March 1998, 40 Afghan clerics issue a fatwa calling for a jihad against the US. A group of Pakistani clerics issues a similar fatwa in April. These fatwas give much more religious authority to bin Laden’s fatwa. It is suspected that bin Laden “discreetly prompted these two bodies to issue the ordinances.” [Gunaratna, 2003, pp. 62-63] Bin Laden then will hold a press conference in May 1998 to publicize the fatwa (see May 26, 1998).